Hey, babes. First of all: apologies for not posting a recipe in foreeeever. I am so preoccupied with school, life, relationships, depression tbh, and another project I am excited to share with y'all soon. Time just keeps slippin away from me, but hey- what else would it do? Moving on: in this post, I'm stoked to share a delicious recipe that is kinda seasonal (pumpkin, right?) as well as a new kitchen gadget I have been using almost everyday since I got it. 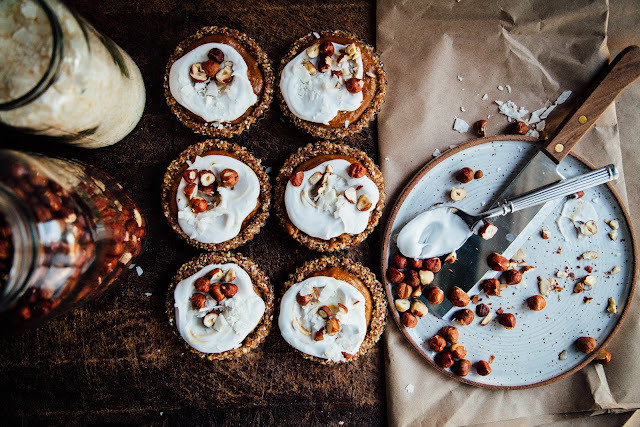 These tarts are pretty much the essence of autumn (and mostly a variation on this recipe, cuz it's so yummy). This time of year is my favourite: the crisp air, vibrantly coloured leaves falling off their branches, warm drinks and forest walks, cozy nights in (or out), layers and toques and thick socks... what's not to love!? Okay, I get that not everyone is nuts about the colder temperatures, but I am not included in that demographic. I feel so much more like myself when the heat and humidity of summer winds down. As the weather cools off and the gray clouds get comfortable for the next several months, I can finally relax and focus again. Anybody else get me on this? Someone?? 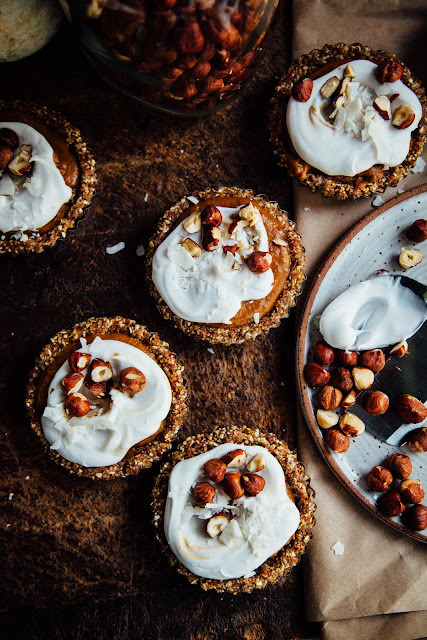 A quick summary of the recipe: we've got a hazelnut-based crust, sweetened with dates. (May I just say: hazelnuts are SO gorgeous?!) 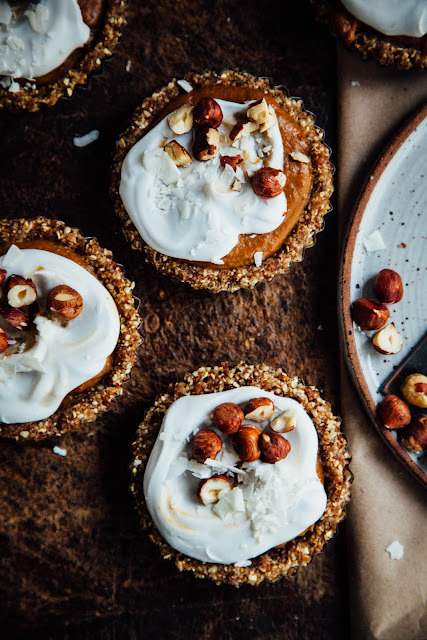 The crust is filled with a luscious spiced pumpkin custard and finally topped off with whipped coconut cream. Drizzling these in a salted caramel sauce is a good idea, but I ran outta time. I gave all these tarts to my parents, they subsequently brought them to two different Halloween parties they attended in one night (they're wild, what can I say) and apparently they were a hit at both events. So even if you don't trust my judgement or taste palate, you can trust a bunch of stranger's. Or... try the recipe yourself. But it's your life, so please do what you want. Now I'm gonna gush for a minute about a new product I am luuuuvin. It's called the Braun MultiQuick 9 (aka MQ9) and it is gonna upgrade your whole kitchen. I have been using it instead of my food processor and blender for several days now. 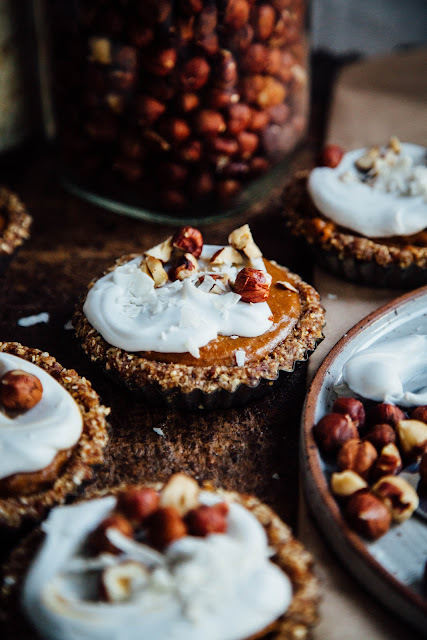 According to a Braun survey, 72% of Canadians and 68% of Americans say they'd get more creative in the kitchen if they had tools that made it easier. Look no further. 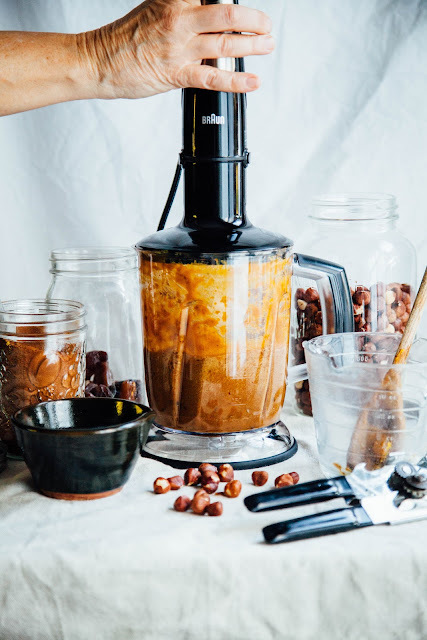 Lemme give you the rundown: the actual tool is a handheld, 700-watt motor that you can then effortlessly click (via the EasyClick system Plus) on to several different attachments, so you don't need a bunch of different bases or containers anymore. This saves a ton of space and clean-up. In case you're confused, this video does a really good job of showcasing the MQ9. Thanks to its unique ActiveBlade technology, the MQ9's shaft moves its blades up and down as they are spinning, maximizing cutting efficiency (i.e. 250% more active cutting surface and 2x finer blending, yes baby). 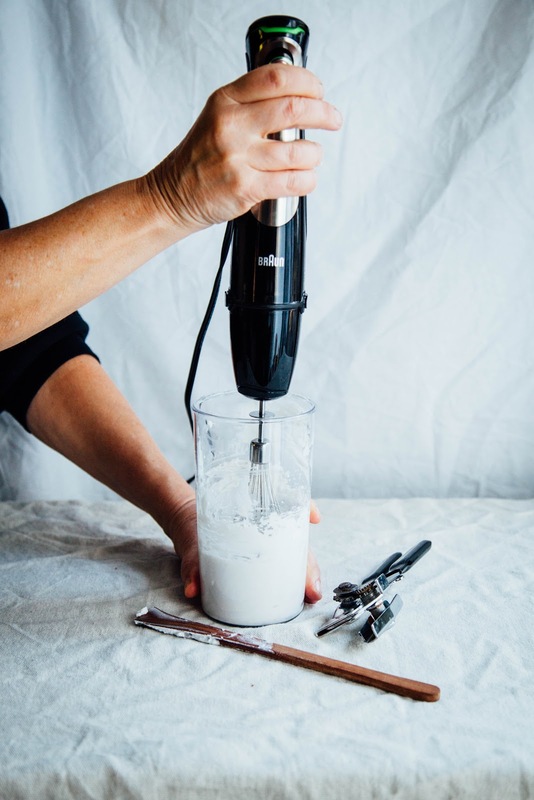 SplashControl keeps your kitchen clean when using the immersion blender attachment. One of my fave things about this tool is the SmartSpeed technology. Instead of dials and buttons on the bases of my food processor and blender, I can simply press lightly or harder on the MQ9's power button; it adjusts the speed of the blades depending on how much pressure I apply with my hand. SO STREAMLINE. I am a big minimalist so the simplicity yet functionality of this tool is something I am excited about, and I'm not the only one. According to that Braun survey I just mentioned, 83% of Canadians and 82% of Americans agree one versatile, multi-use kitchen tool simplifies the cooking experience. I have seriously been hanging out with friends and sounding like an infomercial when I talk about the MQ9 for the past week. I love it and it's changing the way I cook and prepare my food, savin me time and space. So far I have been using the PowerBell Plus attachment most often, to make smoothies for breakfast and after a workout. I appreciate that the MQ9 comes with a smoothie container which doubles as a cup. So when I am done blending, the drink is already poured and I don't have to clean a blender container. All parts of this appliance are BPA-free. The only tool I used to make this entire recipe was the MQ9. Enjoy, cuties! 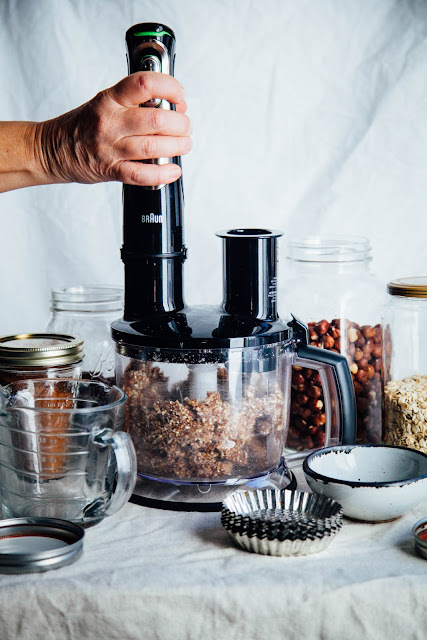 To make the crust: grind the hazelnuts and oats into flour in a food processor. 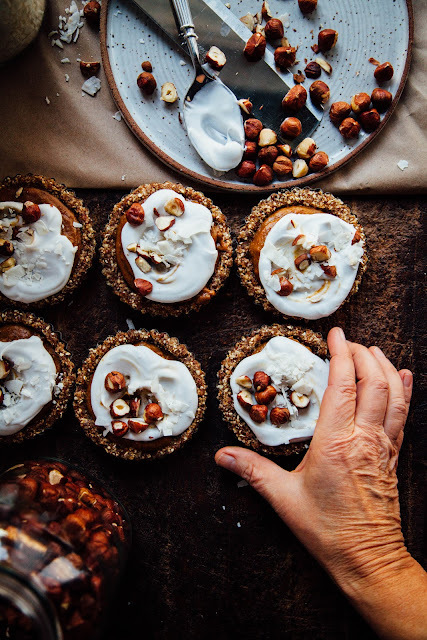 Add the rest of the ingredients and process until the dough is slightly sticky, crumbly and can hold its shape when pressed between two fingers. If it's too crumbly, add more dates, or splash of water or coconut milk. If it's too moist, add a spoonful or two of ground flax seed or more oats. Press the crust evenly into lined or oiled tarts tins and leave in the fridge. To make the filling: blend all ingredients until smooth and DELICIOUS. Pour evenly into your tart crusts and let it set in the fridge overnight or at least for 5 hours, otherwise it'll be more like pudding (which isn't necessarily a bad thing). To make the coconut whipped cream: open the can and scoop the solid white fat off the top. 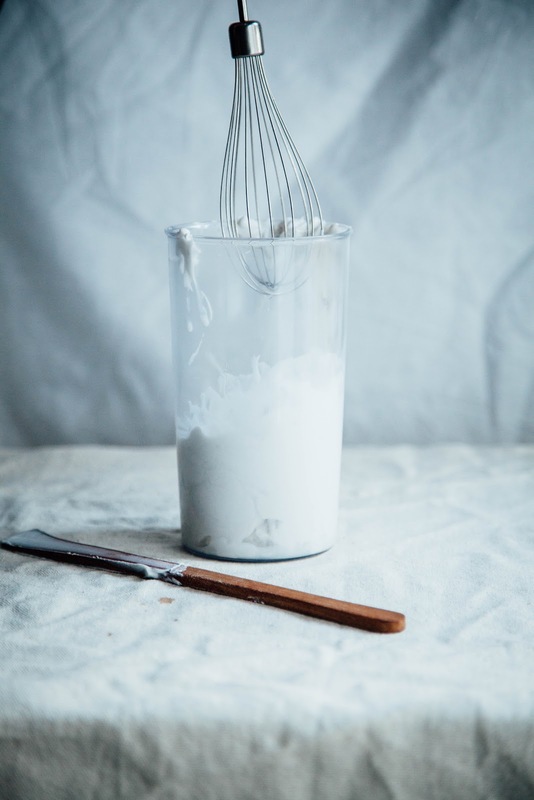 Whip this with the vanilla and maple syrup in a chilled mixer, with an electric whisk, or a hand-operated whisk until it's the consistency of whipped cream! 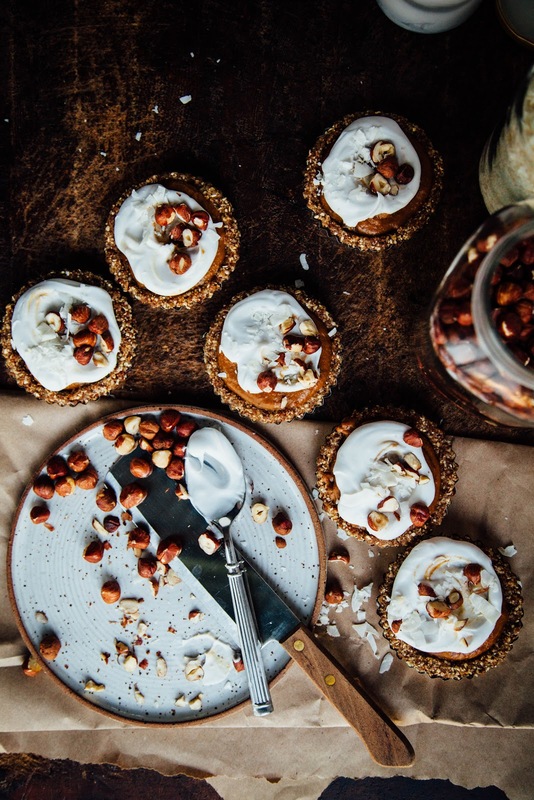 Scoop onto your tarts, decorate with extra chopped hazelnuts and coconut shreds and EAT!